Point 6237 is the first high point on the ridge to Window Peak between Ventana and Esperero Canyons. A nice ridge is visible from many parts of town leading up to it from Ventana Canyon. When at Cardiac Gap on the Esperero trail, one can see a way down that seems doable. Start at Ventana Canyon trailhead and attain the ridge at whatever point you think is right for you. I started off trail at about 1 mile from the trailhead. Once you attain the main ridge, follow it all the way to the peak. The beauty of the entire ridgeline is stunning and you will have a hard time not stopping to take it all in. On close approach to the peak, you will see a rather wide gully between some of the cliffs and this is the easiest way towards the summit. At the summit is a group of hoodoos. It should be somewhat clear which one is the highest and a bit of scrambling will get you there. I decided to return via the ridgeline that falls towards Cardiac Gap.This ridgeline is much wider but also just as beautiful. As you approach Esperero canyon care must be taken not to cliff out. My track went into a very thorny gulley and then into a notch right before the falls. Its likely better (though I can't guarantee it) to cross the creek a bit south but the falls area is pretty nice. Next is a steep section up to Cardiac Gap where you will find the Esperero trail. 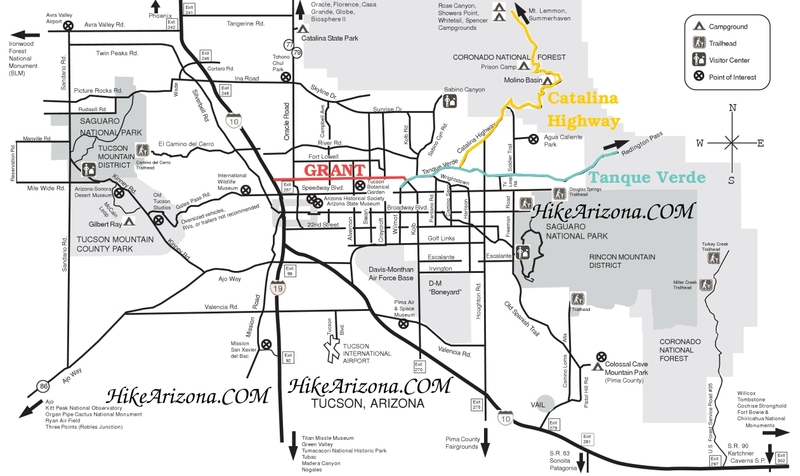 Its about 3.5 miles to the Sabino Canyon Visitor Center from Cardiac Gap.